I am a sucker for hearts and stars, so when I saw this bottle of Nicole by OPI Love Your Life, I knew it had to be mine. It's a clear base with rainbow sparkles and pink flat glitter hearts. I used a base coat of OPI Natural Nail Base Coat, three coats of Love Your Life which included fishing out the hearts with the side of the brush, and a top coat of Seche Vite. I'm thinking in the future, it might be easier to use an orange stick or dotting tool to get the hearts out and place it onto my nail as opposed to attempting to brush the hearts on my nail with the brush. I tried to get about 2 hearts per nail but it wasn't easy. 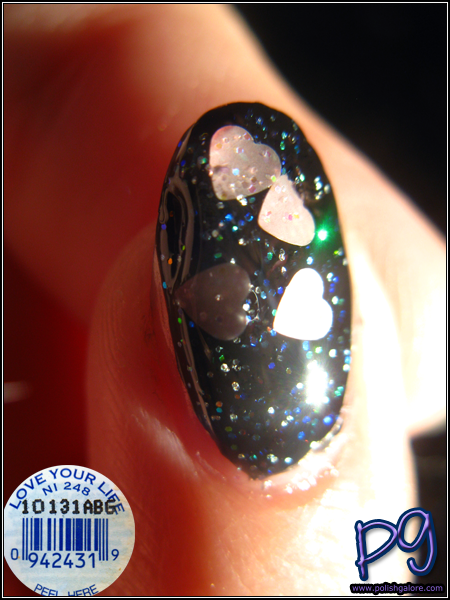 So you can see the glitter a bit better, I put 1 coat of Love your Life over CND Blackjack while getting as many hearts as I possibly could onto my brush. I can't wait to use the heart glitter during Valentine's but it is a bit of work to get them and place them on the nail.